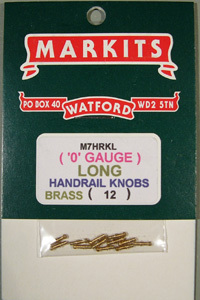 Romford/Markits product Turned Brass. Drilled for 0.7 handrail wire. 12 per pack. Turned brass on long stem. One ball, drilled for .045 wire. Ideal as stanchions for guard rails and railings. Pack of 12. 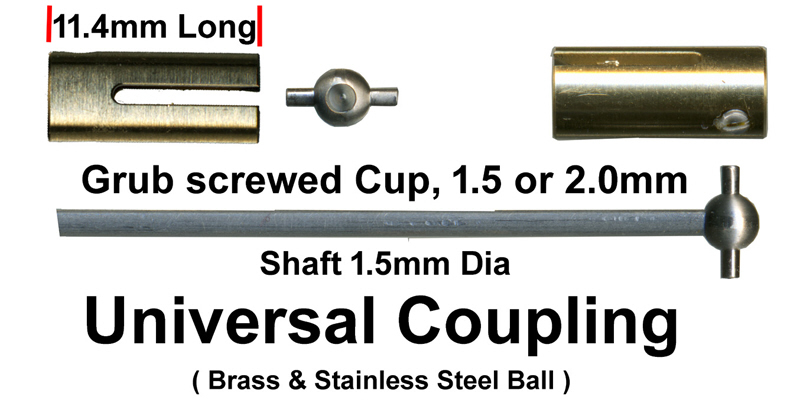 Turned Brass with long stem. 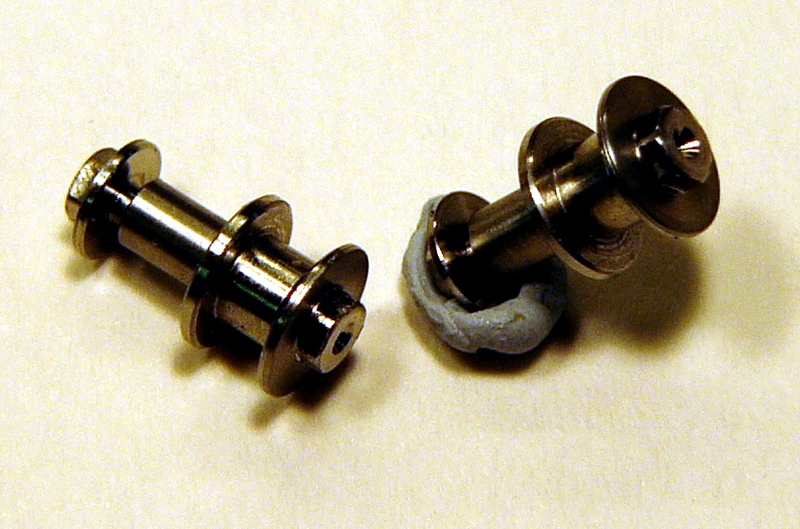 Two balls drilled for .045 wire. Ideal as stanchions for railings. Pack of 12. Turned Brass handrail knobs with long stems. Three balls drilled for .045 wire. Ideal as stanchions for guard rails. Pack of 12. Machined brass tee door handles with collar to aid location. Pack of 16. 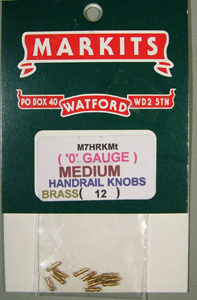 Turned Brass short handrail knobs for WD 2-8-0 and 2-10-0 locomotives. Pack of 12. Turned brass set of parts for BR standard smokebox door handle (Smokebox Dart) I set. 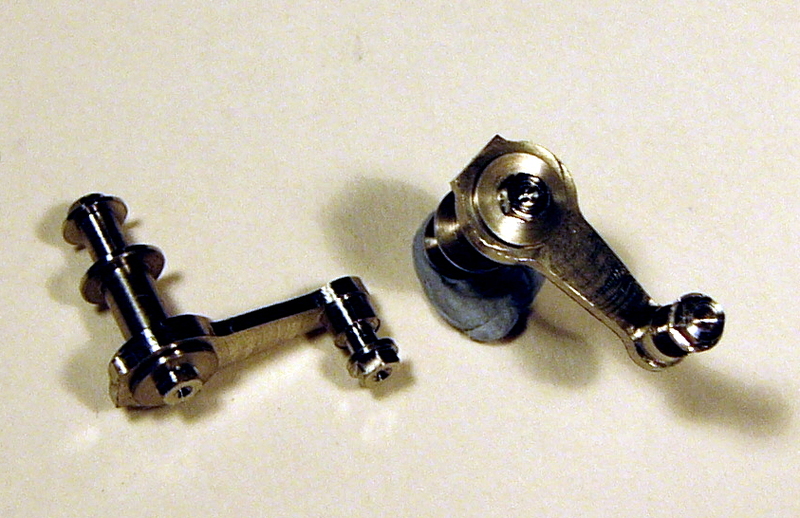 Turned brass set of parts for LMS style smokebox door handle (Smokebox Dart) 1 set. Turned brass set to make one smokebox door handle (Smokebox Dart) with handwheel. Suitable for GCR, LNWR and many other locos. 1 set. Turned brass LNER 3in safety valves. 1 Pair. Turned brass LMS Ivatt/Fowler safety Valves. 1 pair. Turned brass pop safety valves for LMS/BR locos. 1 pair. Turned brass safety valves for LNER Pacifics. 1 pair. Turned brass insert style washout plugs. Pack of 12. Turned brass modern airhorns short + long. Two pairs for one loco. 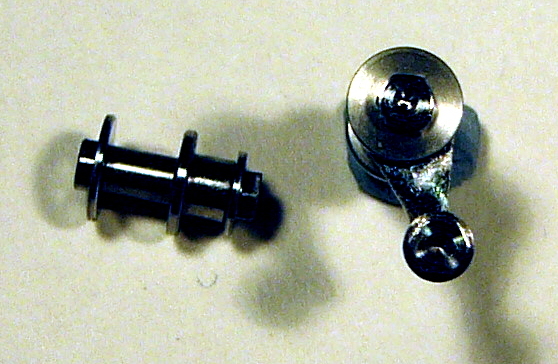 Turned brass GWR whistle set. One small plus one large. 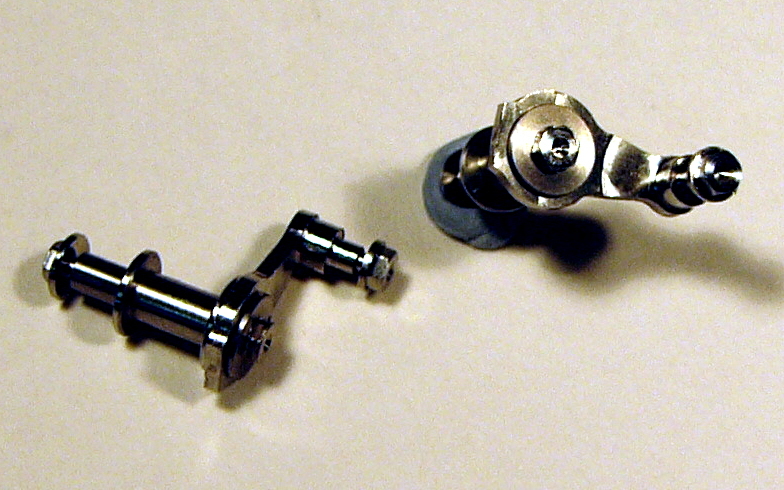 Turned brass whistle suitable for Drummond and Urie locos. One. Turned brass whistle for Stanier locos. One. Turned brass carriage roof vents with round profile for pre-grouping coaches. Drilled for location pin on roof. Pack of 20. Turned brass carriage roof vents. Oval profile for post-grouping and early pre-grouping coaches. Drilled for location pin on roof. Pack of 20. 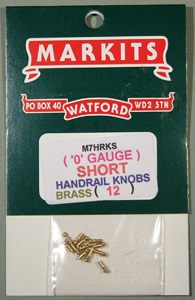 Turned brass carriage ridge and dome roof vents, suitable for BR Mk1 coaches and many others. Drilled for locating pin on roof. Pack of 20. Turned in 3/16" stainless steel. Pass through the hornblock bearings. Place the coupling rods on the tapered ends of the jig to align boxes before fixing. Two axles. Turned in 3/16" stainless steel for standard 0 gauge bearings.